Peggy Armstrong and I started out as neighbors in the 90’s. I lived on Morehead, she lived on Delaware. Our daughters Sarah and Meghan were the same age. I remember the first time I saw her, and I was struck by how well put together she was. Her lipstick was fresh, her hair neatly combed, not like my wild hair with a mind of its own. We were young moms, and often in groups together, and we both liked our differences. Whatevah! We had a lot in common too. We volunteered. We got stuff done. We loved being moms. There was AWARE—where we learned how to trade stocks. That’s where we met Marcy Vandertuig, I still remember when she came up with the idea to buy Whole Foods—Hey Marcy—great idea! It’s a shame we didn’t hang onto that stock! AWARE (Ann Arbor Women Always Ready to Earn) had as its members Carol Adams, Peggy Armstrong, Denise Barton, Paula Bergloff, Bonnie Brickett , Karen Cross, Ruth Haldeman, Lois Kane, Debbie Merion, Sherri Ralston, Karen Soskin, and Marcy VanderTuig. I just pulled up our minutes from our AWARE meeting of 4-15-1999, where I wrote, “Peggy will look at Monsanto, Berringer.” Whatevah is needed! Peggy would always volunteer. She was also the money person, careful in that way you needed to be, and wrote the final checks when the group disbanded in 2006. I loved that she handled that—not my forte. Again, our differences worked. 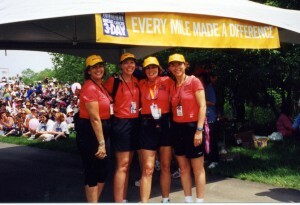 So what made us decide to do the Avon Walk in 2002? It seemed like fun, and useful. 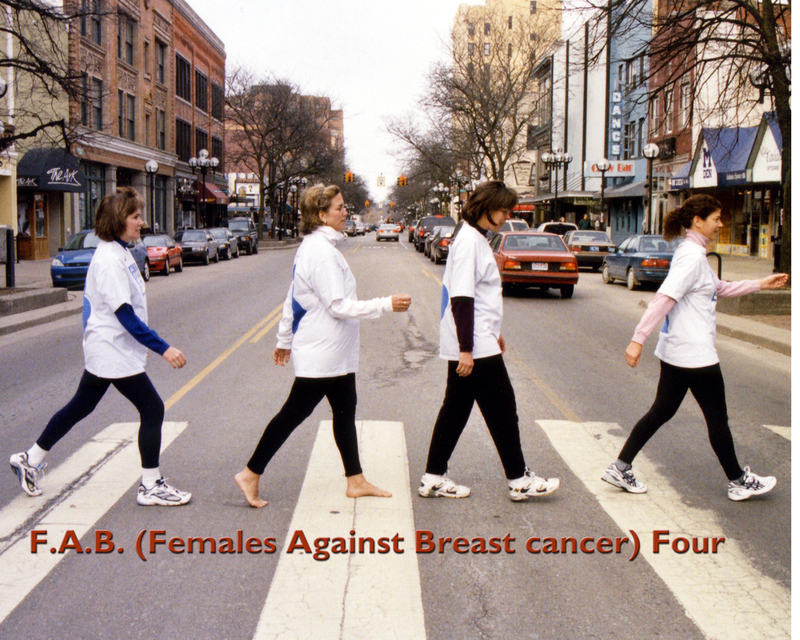 Somehow we became the FAB4, which I had forgotten was an acronym until I found that too in my files; Females Against Breast Cancer. Our dear friend Carol Adams was fighting that disease then. Abbey Road album cover comes to Ann Arbor in 2002 with the NEW FAB 4! 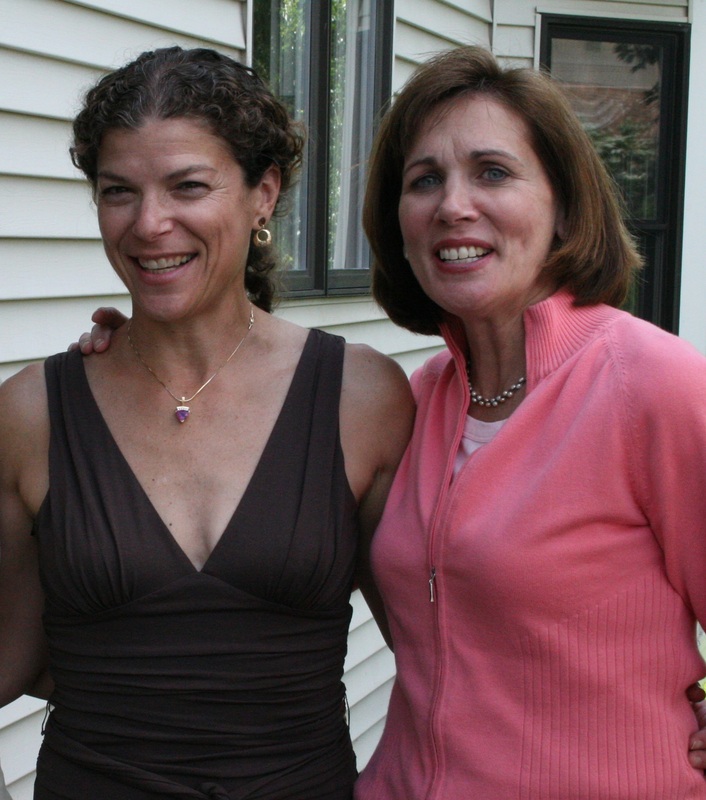 We trained for the 3-Day, 60 mile walk in an organized way—Peggy was always organized! We walked together every Friday morning, from one end of Ann Arbor to the other, with our baggy nylon shorts and fanny bags. Our goal was to be able to walk 20 miles a day. For our final training, we walked to Manchester, and had dinner there. For the walk we picked out matching clothes, and had a logo of us on the zebra crossing, and gave out stickers as we walked. And we worked so hard to raise money, with sales, parties, soliciting friends and family alike. 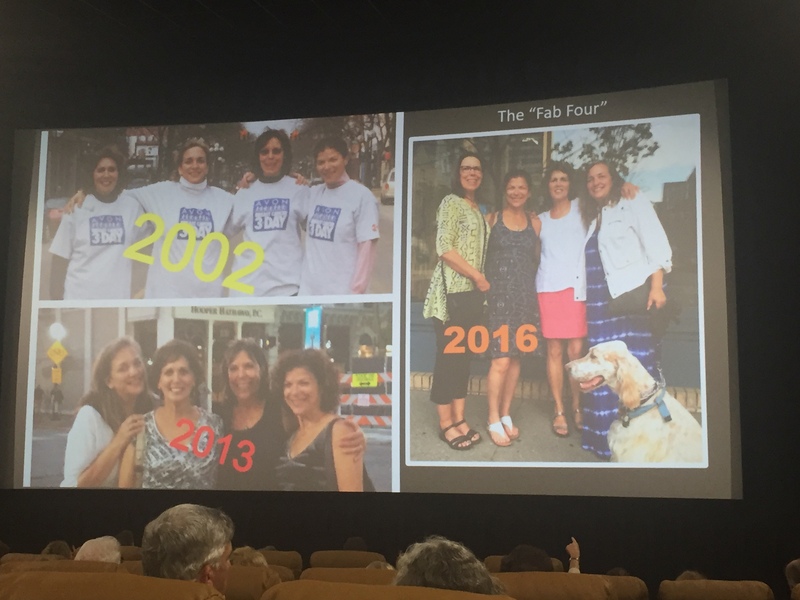 We only needed to raise $2,500 a piece to do the 60 mile, 3-Day walk, but together the four of us raised ten times that amount! Raising $25,000 for breast cancer research was one of my finest moments, and I did it with Peggy Armstrong, Marcy Vandertuig, and Sue McLinden: the FAB 4. But dear God, I so wish that some of that research could have kept Peggy Armstrong with us on this earth. Cancer isn’t fair. During the past year, I began to examine my life, to figure out where I had been, where I wanted to go, what I wanted to do with my future, what I was interested in, and how could I use these interests to contribute to society. I bought a book called Zen and the Art of Making a Living, by Laurence Boldt and began the task of discovering myself. What I discovered was an interest that has been with me my whole life. I began to think about books, reading to my children, reading with kids at school, the passion I feel about books and the comfort of libraries and I began to realize I could live these passions, these interests, every day. This essay started Peggy on her new life of being a librarian. Oh how I loved hearing about those days reading to the kids! But Peggy’s own daughters always owned her heart. She loved them so. The Fab4 celebrated big on our 50th birthdays, and took trips together—to Peggy’s cottage on the lake, Sue’s OakaPiney, and Marcy’s Onekoma farm. We danced to 45s, there was skinny-dipping at midnight. We had more than our share of good times. 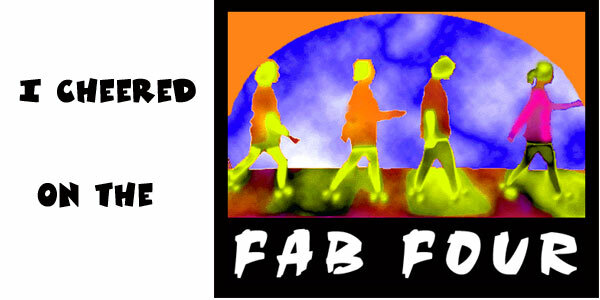 Since 2002, every year the FAB 4 partnership gave us a reason to celebrate life and our friendship. There was the annual night before Art Fair dinner, with wine, walking, and wine. We visited the berry bowl lady, walked up and down and peered into booths getting set up, had a night cap, and sometimes bought treasures…like the night I bought my stained glass fake-but-pretty “Tiffany” lamp. Most recently we recreated the best part of dinner in a conference call—checking up and giggling together on the phone. I learned so much from Peggy. When she started to battle cancer, her blog “Courage” showed me how brave a woman can be. From Peggy I learned how to get things done without handwringing or drama. Even now we are starting to say, when not sure how to handle something, “What Would Peggy Do? ” WWPD? The FAB 4 not only walked, talked, and had dinners together, but we shared a sense of spirituality that transcended religion. We took a class together from a local psychic, Diane Evans. We understood the comfort and strength one can get from faith. And we believed in each other, and in family. We had our “cone of silence.” We had trust, and faith. 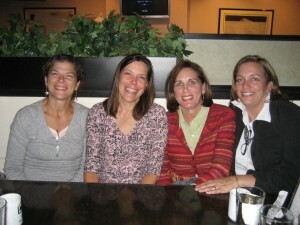 The last time the FAB 4 was together was at Peggy’s “Thank You” party, a brilliant and beautiful event, and sad. So much love was in the room! 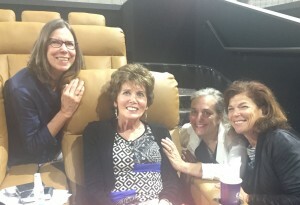 The FAB 4 at Peggy’s “Thank You” Party in June, 2017. We will miss our 4th always, and we have decided to always remain the FAB 4. Peggy, we send you blessings as you transition to being our guardian angel. How ironic that the FAB 4 met through working to end breast cancer, and you passed from what we worked so hard to end, and during the week of our annual FAB 4 Pre-Art Fair dinner. How lucky we all were to know an amazing woman like you. You will be missed forever. 60 miles, 61 years. Peggy, we will miss you dearly. 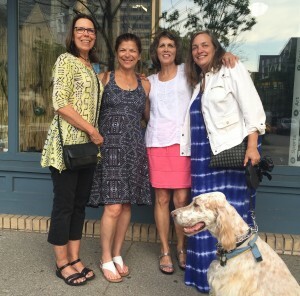 Peggy’s family would like to thank the doctors and staff at Michigan Medicine and Dr. Lu’s Nourishing Life for the support and care they provided to Peggy as she lived with Metastatic Breast Cancer. In lieu of flowers, the family requests that donations be made in Peggy’s name to the Cancer Support Community of Greater Ann Arbor (http://www.cancersupportannarbor.org/) or METAvivor (http://www.metavivor.org/). Peggy loved words and books. Peggy. Margaret. Peg. Mom. Peggy A. Mother. Daughter. Sister. Aunt. Friend. Game Player. Marble Counter. Crossword Puzzler. Outdoor Enthusiast. Animal Admirer. Dog Lover. Tea. Bugles. Good & Plenty. Delish. The Lake. The Lawton Hood. The Huron Hood. THE HOOD. Lived. Well. Laughed. Loud. Loved. Deep. Hearts. Strong. Hearts. Full. Hearts. Connected. Peggy’s life could fill several books. These words are just the beginning.